I’m becoming anxious about climate change, and in particular what that means to my life. We humans are still in denial about climate change, and even though I’ve been told that climate change could destroy ecosystems and economies within a generation – I like to look at the little changes that overpopulation and climate change bring about. Because the textile industry is a major contributor to the emissions which bring about these changes, I thought the topic was apt! I was visiting a friend in Virginia recently. She and her friends were complaining about hiking conditions and how it’s so important to check for ticks after a hike because Lyme disease is so prevalent – complete with lots of stories of friends who had contracted the disease. Less than four decades ago, scientists identified a spiral-shaped bacteria transmitted by the bite of a tiny hard-bodied tick as the cause of an arthritis outbreak among children in southern Connecticut. Since then, Lyme disease has emerged from obscurity to become the leading vector-borne (i.e., transmitted by mosquitos, ticks and/or fleas) disease in the United States. 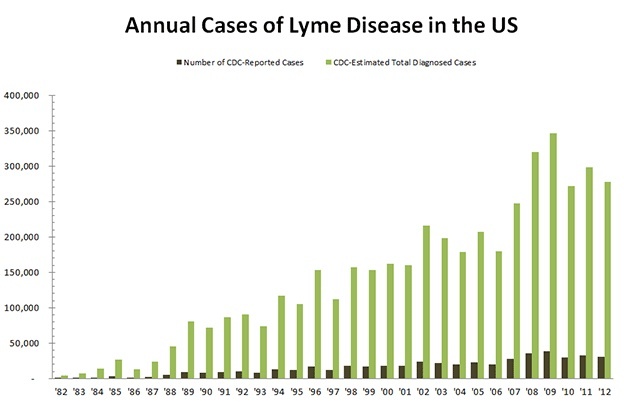 The 27,203 confirmed new cases reported to federal health authorities in 2013 marked nearly a 25 percent jump over the previous year, and the total number of cases of Lyme disease has doubled since 1991. The CDC estimates that the number of infections is likely 10 times higher than reported, nearly 300,000 new cases per year based on lab test data. Yale University researchers say that 10 percent of the population of southern New England has evidence of a previous Lyme disease infection. Why is this happening? While the disease is reported coast-to-coast, it is highly concentrated on the Eastern Seaboard, with a range expanding north into Canada and south through Virginia. Tick habitat and populations are influenced by many factors, but one of them is climate. This spring the U.S. Environmental Protection Agency added Lyme disease to its list of climate change indicators. Scientists from Yale University have determined that climate impacts the severity of Lyme disease by influencing the feeding patterns of deer ticks that carry and transmit it. Deer ticks live for two years and have three stages of life – larval, nymphal and adult. They obtain one blood meal during each stage in order to survive. If the source of the first meal (a mouse, bird or other small animal) is infected with the bacterium that causes Lyme disease, the tick also becomes infected and passes it on to its next meal source – be it wildlife or human – in its second life stage as a nymph. The researchers found that this cycle is heavily influenced by climate, which has the following effects on Lyme disease: An acceleration of the tick’s developmental cycle, a prolonged developmental cycle, increased egg production, increased population density, and a broader range of risk areas. Once the larvae have molted into the nymphal stage, the winter forces them to remain dormant until spring. An adult tick no longer needs to hibernate during the winter, so these ticks may become active on warm winter days, yielding a larger nymph population the following year. With an earlier winter thawing, nymphal-staged ticks will become active sooner. The warmer winters will also allow for a higher survival rate of the white-footed mouse, a popular host for the ticks, meaning an increased tick population in the spring and summer. In the Midwest, where there are greater extremes of temperature, there is a shorter window of opportunity for tick feeding, and therefore a shorter gap between nymphal and larval feedings. Because of this, report the scientists, Midwestern wildlife and ticks are infected with less persistent strains, which correlates with fewer cases of Lyme disease reported in the Midwest. The clear implication of this research, say the researchers, is that, as the planet warms, the Upper Midwest could find itself in the same situation as the Northeast: longer gaps between nymphal and larval feeding, and therefore, stronger, more persistent strains of Lyme disease.